Who is the author of this insightful comment? Lenin, Trotsky, or perhaps the early Russian Marxist Plekhanov? In fact, it is from Max Weber, the well known bourgeois sociologist. Although Weber never developed this insight, he is suggesting here that there is an intrinsic contradiction between capitalism and democracy. The history of the 20th century seems to confirm this opinion: very often, when the power of the ruling classes seemed to the threatened by the people, democracy was pushed aside as a luxury that one couldn’t afford, and replaced by fascism–Europe in the 1920s and ’30s–or military dictatorship: Latin America in the 1960s and ’70s. Fortunately enough, this is not the case of Europe today, but we have, particularly during the last decades with the triumph of neoliberalism, a democracy of low intensity, a democracy without social content, which has become an empty shell. Sure enough, we still have elections, but there seems to be only one party, the U.M.P., United Market Party, with two variants which have only limited differences: the right-wing neoliberal version, and the left-center social-liberal one. 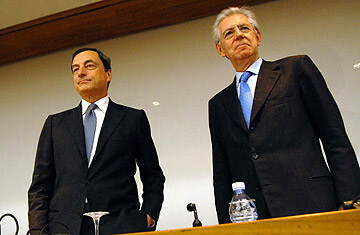 Mario Draghi, head of the European Central Bank, and Mario Monti, former European Commissioner–both former employees of Goldman Sachs. The decline of democracy is particularly visible in the oligarchic functioning of the European Union, where the European Parliament has very little influence, while power is firmly in the hands of non-elected bodies, such as the European Commission, or the Central European Bank. According to Giandomenico Majone, Professor at the Europen Institute of Florence, and one of the semi-official theoreticians of the Union, Europe needs “non-majoritarian institutions,” i.e. “public institutions that are, on purpose, not responsible neither towards electors nor elected officials,” the only way to protect us against “the tyranny of the majority.” In such institutions “qualities such as expertise, professional discretion and coherence (…) are much more important than the direct democratic responsibility.”2 One could hardly imagine a more blatant apology for the oligarchic and antidemocratic nature of the Union. With the present economic crisis, democracy has descended to its lowest levels. In an recent editorial, the French Journal Le Figaro wrote that the present situation is an exceptional one, and this explains why democratic procedures cannot be always respected; when normal times return, we can re-establish democratic legitimacy. We have therefore a sort of economic/political “state of exception” in the sense of Carl Schmitt. But who is the sovereign that has the right to proclaim, according to Schmitt, the state of exception? For some time after 1789 and before the proclamation of the French Republic in 1792, the King had the constitutional right of Veto. Whatever the resolutions of the National Assembly, whatever the desires and aspirations of the French people, the last word belonged to His Majesty. In Europe today, the King is not a Bourbon or Habsburg, the King is Financial Capital. All the present European governments–except the Greek one!–are functionaries of this absolutist, intolerant, and anti-democratic Monarch. Whether right-wing, “extreme-center,” or pseudo-leftist; whether conservative, demo-Christian, or social-democratic, they fanatically serve her Majesty’s right of Veto. The absolute and total sovereign today in Europe is, therefore, the global financial market. Financial markets dictate to each country the wages and pensions, cuts in social expenses, privatizations, the rate of unemployment. Some time ago, they directly nominate the heads of government (Papademos in Greece and Mario Monti in Italy), picking so-called “experts” who are faithful servants of the financial markets. Let us have a closer look at some of these all-powerful “experts.” Where do they come from? Mario Draghi, head of the Central European Bank, is a former manager of Goldman Sachs; Mario Monti, former European Commissioner, is also a former adviser to Goldman Sachs. Monti and Papademos are members of the Trilateral Commission, a very select club of politicians and bankers that discuss what to do next. The President of the European Trilateral is Peter Sutherland, former European Commissioner, and former manager at Goldman Sachs; the vice-president of the Trilateral, Vladimir Dlouhy, former Czech Minister of Economy, is now adviser to Goldman Sachs for Eastern Europe. In other words, the “experts” in charge of saving Europe from the crisis used to work for one of the banks directly responsible for the sub-prime crisis in the United States. This doesn’t mean that there is a conspiracy to deliver Europe to Goldman Sachs; it only illustrates the oligarchic nature of the “experts” elite ruling the Union. The governments of Europe are indifferent to public protest, strikes, and mass demonstrations, and don’t care about the opinion or the feelings of the population; they are attentive–extremely attentive–only to the opinion and the feelings of the financial markets, and their employees, the ratings agencies. In the European pseudo-democracy, to consult the people by a referendum is a dangerous heresy–worse, a crime against the Holy Market. The Greek referendum was not only about fundamental economic and social issues, it was also and above all about democracy. The 61.3 per cent Greek NO was an attempt to challenge the Royal Veto of finance. This could have been a first step towards the transformation of Europe, from capitalist Monarchy into a democratic Republic. But the present European oligarchic institutions have little tolerance for democracy. They immediately punished the Greek people for their insolent attempt to refuse the austericide. Catastroika is back in Greece with a vengeance, imposing a brutal program of economically recessive, socially injust, and humanly unsustainable measures. The German right-wing fabricated this monster, and forced it on the Greek people with the complicity of Greece false “friends” (Hollande, Renzi, etc). While the crisis gets worse and public outrage grows, there is an increasing temptation, for many governments, to distract public attention towards a scapegoat: the immigrants. Thus undocumented foreigners, non-communitarian immigrants, Muslims, and Roma (Gypsies) are being presented as the main threat to the country. This of course opens great opportunities for racist, xenophobic, semi-fascist, or outright fascist parties, which are growing and are already, in several countries, part of the government–a very serious threat to democracy in Europe. The only hope is the growing aspiration for another Europe, beyond savage competition, brutal austerity policies, and eternal debts to be paid. Another Europe is possible, a democratic, ecological, and social one. But it will not be achieved without a common struggle of the European populations, beyond ethnic borders and the narrow limits of the nation-State. In other words, our hope for the future is popular indignation, and the social movements, which have been on the rise, particularly among youth and women, in several countries. For the social movements, it is becoming increasingly obvious that the struggle for democracy is a struggle against neoliberalism, and, in the last analysis, against capitalism itself, an inherently antidemocratic system, as Max Weber already pointed out a hundred years ago. Michael Löwy is a Marxist sociologist and philosopher living in Paris. His most recent book is Ecosocialism: A Radical Alternative to Capitalist Catastrophe (Haymarket Books, 2015). This article was written for Avghi (Dawn), the daily paper of Syriza. Max Weber, «Zur Lage der bürgerlichen Demokratie in Russland», Archiv für Sozialwissenschaft und Sozialpolitik, Band 22, 1906, Beiheft, p. 353. Quoted in Perry Anderson, Le Nouveau Vieux Monde, Marseile, Agone, 2011, pp. 154,158.